Everyone gets 168 hours a week, but it never feels like enough, does it? Work gobbles up the lion’s share–many professionals are working as much as 70 hours a week–leaving less and less for rest, exercise, family, and friends. You know, all those things that make life great. Most people think productivity is about finding or saving time. But it’s not. It’s about making our time work for us. Just imagine having free time again. It’s not a pipe dream. 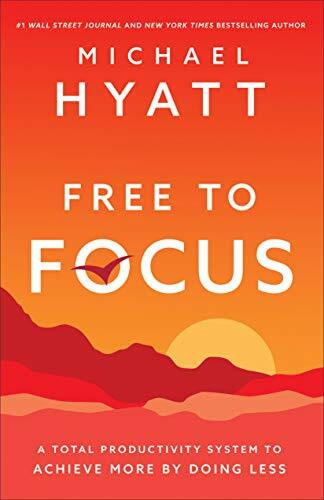 In Free to Focus, New York Times bestselling author Michael Hyatt reveals to readers nine proven ways to win at work so they are finally free to succeed at the rest of life–their health, relationships, hobbies, and more. He helps readers redefine their goals, evaluate what’s working, cut out the nonessentials, focus on the most important tasks, manage their time and energy, and build momentum for a lifetime of success. I’ve been a fan of Michael Hyatt’s message for a long time. His productivity tips and his view on leadership have taught me so much. This book is no exception. From the opening pages he stresses the importance of the individual determining what is truly important. Not just from the standpoint of work but the whole person. I think one of my favorite quotes from the book would be: “People who can learn from their experiences and use those lessons to make positive changes in their behavior will advance quickly.” I’m quite happy to learn from Michael’s experiences and skip a few of the headaches. If you want to learn a practical process to doing more in less time, definitely check out this book. Disclaimer: I received a complimentary copy of this book from the author. Opinions expressed in this review are completely my own.